The Gamma also has “Multiple Notches,” selectable by categories, so you’ll be able to select pre-programmed discrimination settings and spend your time digging treasure – not programming your metal detector! Another advanced feature on the Gamma is the “Ground Mineralization Readout” which will describe what you’re encountering in the ground. This is extremely helpful as you ground balance your machine in various terrain. Wet, salty beach sand, and highly mineralized black sand are two common conditions that will highly benefit from this feature. A running depth indicator will show you how deeply buried treasure lies, while the audio pitch will change in proportion to the strength of the target’s signal (which means the louder a target, the closer it is!). 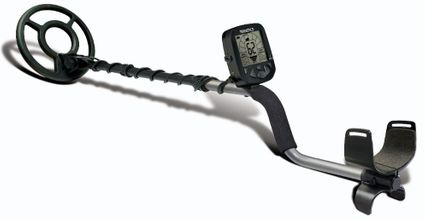 All those features combine with the bonus of fully static, push-button pinpointing capability to make this metal detector do it all for you – and fast!